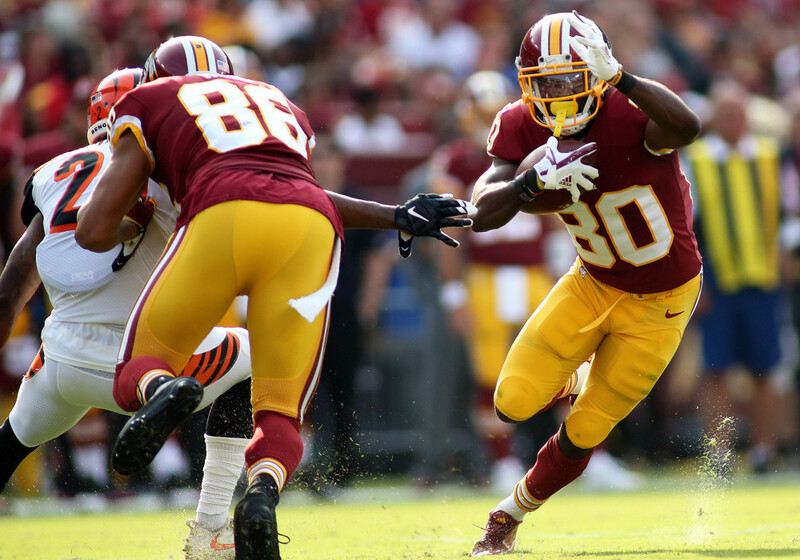 In his sophomore season, Washington Redskins’ Jamison Crowder had 67 receptions for 847 yards and scored a team high in touchdowns with 7. Crowder flew somewhat under the radar and finished the season as the 31st ranked wide receiver in PPR scoring this past season. Some might think this was in part due to Jordan Reed missing 4 games. Last year in PPR leagues, he scored 12.33 points per game with Reed in the offense, compared with 11.4 points when he was out of the lineup. Additionally, Crowder saw more targets per game (4.42) when Reed played than when he was absent (5.75). Crowder performed betterin these categories with Reed playing and this makes perfect sense. With Reed lined up at the tight end position and Crowder playing primarily in the slot, the defenses’ attention was focused more on Reed, allowing Crowder more opportunities underneath. Crowder is currently being drafted as the 29th wide receiver being taken at 6.01 overall in fantasy football ADP. Data is from 12-team PPR mock drafts. 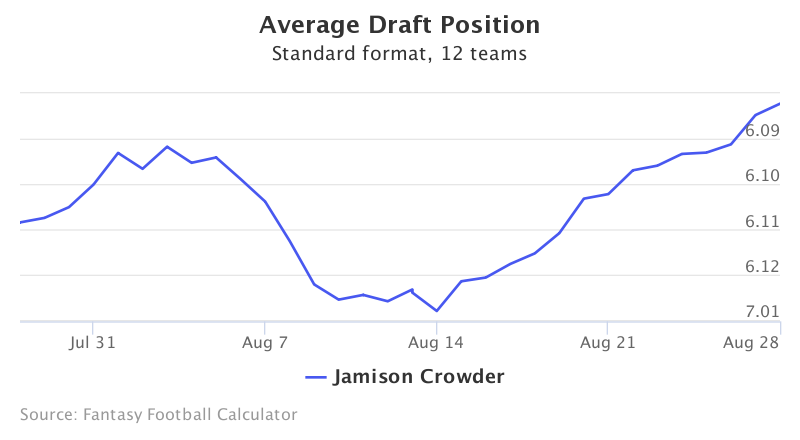 Over the past month Crowder’s ADP has dropped 4 spots overall and he is currently on pace to be chosen in the back-end of the 5th round. The Washington Post’s Mike Jones wrote about how, until Reed returns to the offense from his injury, Crowder is the number one option in the passing game. As Terrelle Pryor slowly works his way into the offense, it’s Crowder who has earned Kirk Cousins’ first read. Throughout training camp, Crowder has been playing on the outside as well as in the slot where he usually lines up – in both roles he’s had a lot of success so far and is a versatile player that can be dangerous from any position on the field. Last year Crowder ran the ball twice, and with DeSean Jackson now in Tampa Bay, it’s possible they use Crowder to be the recipient on short screens and reverses this year. Crowder has generated a lot buzz this offseason, and his rapport with Cousins continues to build momentum in 2017. In limited action during his preseason game against the Green Bay Packers in Week 2, he was targeted five times and scored a touchdown. While Crowder may not replicate his TD total in 2016 with there being so much anticipated for Terrelle Pryor and a (hopefully) healthy Jordan Reed, Crowder can definitely push to lead the team in targets, which is extremely important in PPR leagues. If you decide to wait on quarterback and tight end when drafting this year, Crowder can provide a stable floor each week and return WR 3 or flex spot value with upside.